Ciclovia, Sunday Parkways, Open Streets, Walk and Roll — no matter what your community calls its car-free street event, they are well worth the effort, according to a new study published in the Journal of Urban Health. A careful cost-benefit analysis of Ciclovia-style events in four different countries found that the health benefits of these type of events far exceed the costs. The results of all this number-crunching showed that these programs are definitely worth the investment because they reduce health costs and allow people to live longer — and therefore more economically productive — lives. 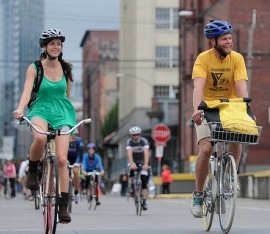 The study analyzed the costs and participation numbers of four ciclovia events: the original Ciclovia in Bogota; the Via RecreActiva in Guadalajara (which I participated in back in 2009); the Medellin Ciclovia; and the Sunday Streets events in San Francisco (which are similar to our Sunday Parkways). Learning about the tremendous health benefits that result from closing streets to car traffic just a few days a year makes you wonder how much society would benefit if more people felt comfortable being active on city streets every day. Elsewhere on the Network today: Rebuilding Place in the Urban Space shares a video that flips the “Portlandia” concept on its head with “The Dream of the Suburbs is Alive in Vancouver (Washington).” Riding in Riverside defends vehicular cycling advocates based on street conditions in the suburbs. And Grid Chicago reports that as Chi Town achieves attainment status on one air pollution measure, the region will lose $90 million in funding that could have been used for sustainable transportation projects.